Recently the Micromax Canvas 2.2 A114 appeared online, no another smartphone from the company is available online, the BOLT A47. The new Bolt A 47 is priced at RS 4,699 it would compete with recently launched smartphones by DATAWIND’s. If you are looking for 3G smartphone, then this might be not for you. 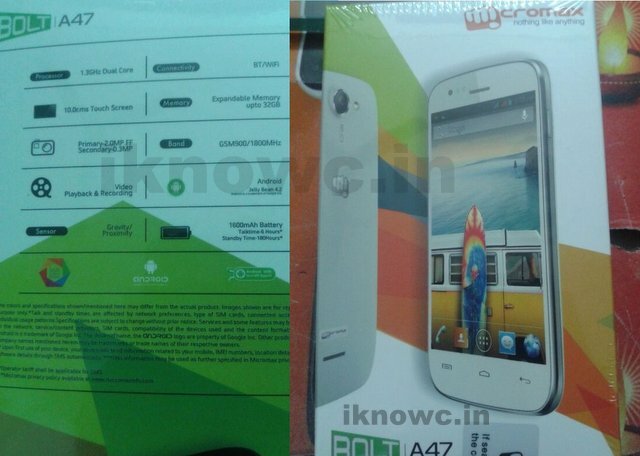 The Micromax A54 ( REVIEW) is much better than this A47, tha A54 has 3G connectivity and 3MP rear camera. Some features are still unknown, such as screen resolution and internal storage.